A. Special Officers (SOs) of KGBVs/URSs. Candidate should have completed 25 years of age and not have completed 44 years of age as on 01.06.2018. In case of SC/ST/BC candidates the maximum age limit shall be 49 years, 10 years relaxation for Physically Challenged. Candidate should have completed 25 years of age and not have completed 44 years of ages as on 0l.06.2018. In case of SC/ST/BC candidates the maximum age limit shall be 49 years, 10 years relaxation for Physically Challenged. The written test shall be 3.00 hours duration and will consist of Descriptive type of Questions. The test will be in English Medium for SOs of KGBV and Telugu medium for SOs of URSs the Scheme of Examination is enclosed 'in Annexure-I. The written test shall be 3.00 Hours duration and will consist of Descriptive type of Questions. The test will be in English Medium and the Scheme of Examination is enclosed in Annexure-1. Candidate should present the following certificates in original for verification when called for. b. Degree Certificate and B.Ed. Certificate. e. One passport size photo. 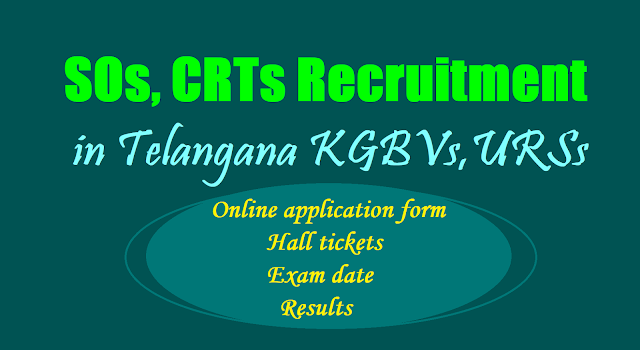 Application should be submitted through online (www.cdse.telangana.gov.in). The uploaded application form along with copies of documents as prescribed must be submitted to the District Educational Officer. Starting date for online application: 20.06.2018. Last date for online application: 23.06.2018. Date of Exam for PGCRTs: 03.07.2018. Date of Exam for CRTs, PETs: 04.07.2018. 1. He/She is Provisionally permitted to write the Examination and Selection will be done only on Merit, submission of TET, Qualification Certificates required for the applied post, Bonafide Certificate (from 4th to 10th class) and other requisite certificates as per norms. 2. The test will be conducted for 100 marks with a duration of 3.00 hours (180 minutes). 3. The candidate should attend the exam hall at least 30 minutes before the commencement of the Exam. 4. Candidates are not allowed to bring Calculators/Logarithm tables/Cell phones and other forbidden material in to the exam hall. 5. Answers have to be written in the Answer book provided using black or blue ink(ball point pen).